Think about your Business Infrastructure, running applications, growing Customers, large clientele, Confidential Business plans, company records, contracts, and financial data and other valuable information’s. Now think what would happen if suddenly, everything was gone? Don’t let your company go extinct! System failures, property damage, malicious attacks, and even human error: all threaten the existence of your business. 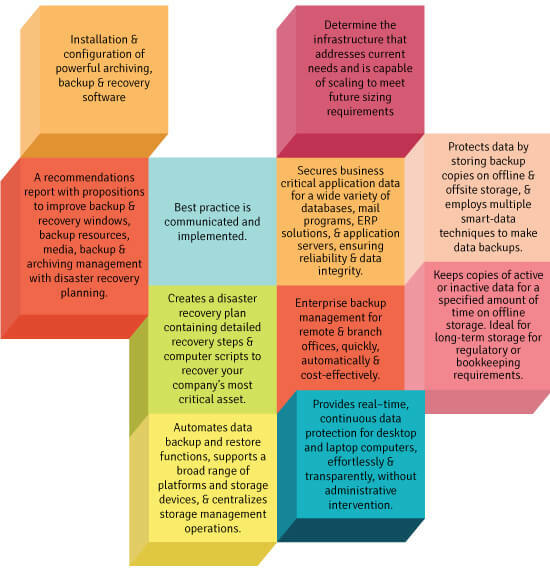 Large enterprises have sophisticated backup and recovery systems that ensure they can get back-to-business within minutes of a disaster. At Royal Cyber, we know that your company’s biggest asset is the information you use to run it successfully. Loss of this information is always a threat to the operation of your business so with our solution for Enterprise backup and disaster recovery we offer superior protection of your irreplaceable data and minimize the adverse effects of a major unplanned outage on your business.